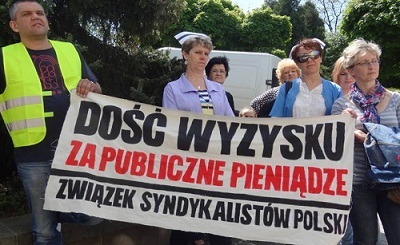 The workers of the psychiatric hospital in Bielsko-Biała have two demands regarding pay and 19 concerning working conditions. The demands concern raises and problems with health and safety. If the demands are not met, the staff wants to go on strike. The demands are sent by the Union of Psychiatic and Addiction Workers, called by the ZSP, which is the only union working in the hospital. On February 15, there was a meeting of the union with the director of the hospital, Lucyna Łagowska. The meeting ended with the signing of a protocol of disagreement. None of the 21 postulates were accepted. We asked Grzegorz and Agnieszka to comment. - A raise of basic salary by 500 zloties net, or 612 zloties gross starting from 30.11.2015. The raise should be for all - nurses, orderlies, psychologists, social workers, therapists, addiction specialists. secretaries and intake and service workers. The postulates of the workers from 2007-2011 were never implemented. There have been no raises since 2011. The unionists pointed out that the last raises did not cover all workers equally. Another collective dispute started in November 2015. - An extra payment for nurses and orderlies working on the ground floor because of their especially difficult work and dangerous conditions and 24 hour work - 300 zł net. This is a difficult job in the hospital. They work 24 hours (on days off, Sundays and holidays), all year round. All categories of patients with various disturbaces work there. More and more people who used drugs are brought in an extremely agressive state. This is often the same with people under the influence of alcohol. .
- The creation of a cloak room in accordance with the Order of the Ministry of Labour and Social Policy of September 26 1997. The hospital does not fulfill this order which was put to comply with sanitary norms. Postulat ten wynika z niespełnienia przez pracodawcę warunków określonych w w/w rozporządzeniu. - The creation of a workers room in the rehabilitation ward where they can eat meals and spend breaks. - Equipping the therapy room in accordance with norms. There are groups of about 20 patients for rehabilitation but the room does not accomodate them all. There needs to be a discussion on the conditions in which the patients get physical therapy and on the working conditions of the therapists. Therapists are required to do things that they cannot do adequately because of lack of conditions. This is both because the work in not properly organized and the rooms do not meet norms. - Reorganization of the rooms so that they meet standards. The rooms are too small for the number of beds, sometimes you cannot get to the patients, which effects the ability to get to them quickly if they need medical help. This is crucial if ones life is in danger. There are often situations where it is difficult to wheel the bed of a patient out of the room without a lot of moving and taking apart things. - The room in rehabilitation should have chairs and furniture which can be washed. This is a sanitary norm that the furniture can equipment must be able to wash and disinfect easily. - Guaranteeing material for physical therapy with the patients. This has been ignored for years. Often therapists have to bring their private material. - Checking the electric, ventillation, gas and fire prevention installations in accordance with the building law and energy law. This hasn't been checked in years and the workers and patients are worried about their safety. Especially as there are often electric failures. In additon, the health and safety inspector recommended the installation of a new fire prevention system years ago, but it was never installed. - Changing damaged and unsafe heaters. - Putting a sink in the workers' room. This is a sanitary norm. - Setting up a place for patients to smoke so that they do not have unlimited rights to smoke wherever they want and harm the health of non-smoking patients and personnel. Of course this can be discussed and we do not appeal to ban smoking entirely, but to eliminate the negative impact on non-smokers. We have a concrete proposal about a smokers' lounge. - Hiring somebody to cook meals, give them to patients and clean at the facility for minors. Currently nurses or psychologists do this, even though it is not their work. - Hiring more medical secretaries. The secretary at intake in the addictions unit works only until 3PM but it is open 7:30 – 20:00. So if anybody calls or comes after 3PM, they expect therapists, who are supposed to be doing therapy, to do this work. All this shows that they do not guarantee good working conditions at the hospital and also that the patients are not treated correctly.